One day, while my husband and I were getting ready to go out of town, I had something of an epiphany. Suddenly I thought technically, we are adults. Not even technically. We are actually, entirely and undisputedly adults. We have reached an age where we can’t pretend that we’re unable to afford the kinds of things that adults should invest in, and it’s about time that we stop throwing money away at temporary alternatives. The reason this came up is that I picked up three different suitcases so I could start packing and realized that each of them was unusable in some way. I had used them like this before, and didn’t think much of it, but I quickly became aware that my luggage might not make it through one more trip. More than that, I realized we’re not college students any more. We’re professionals who need reliable luggage. My instinct was to go for another inexpensive option because that’s what I’ve always done. However, sense prevailed, and I decided I needed something durable and professional looking that will stand up to the kind of clumsy catastrophes I can put my stuff through. 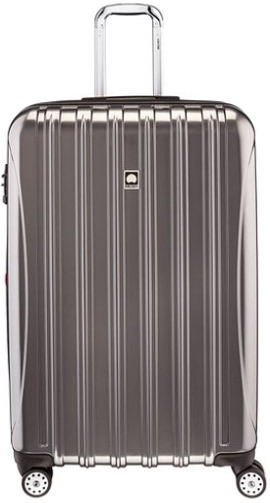 The Delsey Luggage Helium Aero Expandable Spinner Trolley could be that bag. It isn’t incredibly expensive, but it also isn’t a cheap alternative. It comes in four sizes, two carry ons that can fit in an overhead compartment, and two full-sized bags that will have to be checked. All models sport a polycarbonate exterior that can be put through quite a bit of torture without showing any wear and tear. Even with all of the reinforcements to the exterior, it’s still not heavy and will not weigh you down as you’re trying to get through the airport. The carry ons also improve upon some of the complaints that come up with hard cases by offering small pockets that can hold boarding passes, charging cables, toiletries and the like, while a larger pocket gives you external access to things like your laptop or tablet. Helium Aero show that hard cases don’t have to limit access to your things. In the past, tough shells meant that once it was packed, you would have to open it up entirely to get to your things, which isn’t always such a great idea when there are other people around! The spinner wheels mean that, even though the case is lightweight on its own, you don’t have to worry about managing any of the weight of the items you put inside because it simply glides across the floor. Just set it upright and push alongside you. Hard Exterior Still Has Style. Shiny Style. Helium Aero comes in three colors, but the colors aren’t available in all sizes. Pick from charcoal, navy or silver. You won’t get a lot of flash or pattern, but the options have plenty of shine. One of the most common complaints I’ve come across is the size of the 29 inch bag. 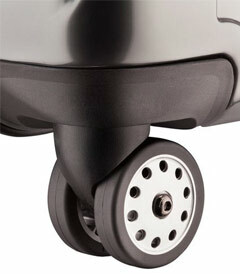 For some airlines, it falls outside of the regular sized baggage limit because the wheels add a small amount of height. In some cases, that can cost travelers a hefty oversized baggage charge (something none of us like to pay for)! I only mention this because I think it’s important you know the 29 inch will probably have to be checked at the airport. There is a possible issue surrounding odor with this case because it has a hard shell, and this isn’t just limited to Helium Aero. I’ve found out this is due to the material the cases are made out of, so they can have a type of “new suitcase” smell right out of the box. The best way to deal with this is to air your new set of luggage. Otherwise, you may have the privilege of smelling like suitcase on your first trips! Does That Helium “Float” For You? There are plenty of people who absolutely swear by the Helium Aero, and they get everything they want out of it. If the features have grabbed your interest in terms of what you need, head on over to the International Carry On on Amazon and get one.